Follow this timeline for a smooth transition from tenant to homeowner. Invest in yourself. Build equity and wealth. Say goodbye to your landlord. Just some of the reasons why owning your own home beats renting. And with rent prices continuing to soar, now is the time to start planning to buy your first home. Yes, planning is absolutely necessary. Without taking the time to evaluate your need and establish a good financial position, a first time home buyer can be overwhelmed and frustrated. 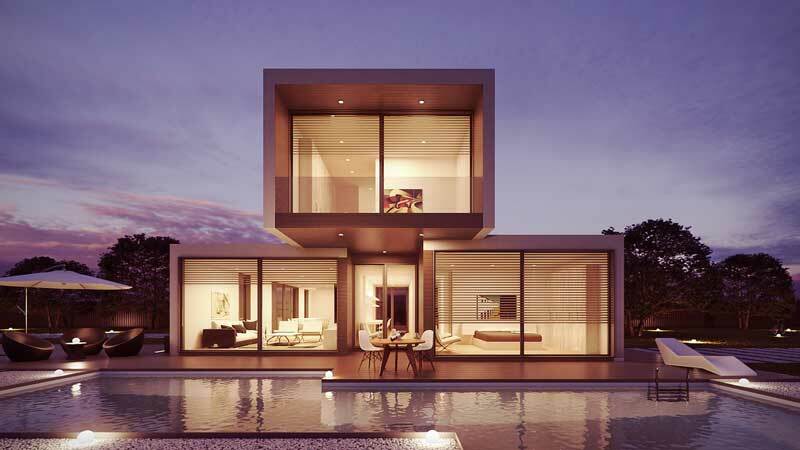 You’re probably looking for something more modest than the luxury contemporary home shown above. But it got your attention didn’t it? Anyway, here’s a checklist that covers the 12-month period before owning your own home. Fix Credit Issues – All buyers should have a good hold on their credit report. Review it periodically to insure accuracy and dispute any errors. Last minute surprises could cost you the loan approval. You can run a FREE annual report from the 3 big companies (Equifax, TransUnions, & Experian) at AnnualCreditReport.com. What Can You Afford – Many buyers think they can estimate this number themselves, but it is strongly recommended you consult with a mortgage banker or broker to get a professional evaluation of your financial position and what you can afford to buy. Prepare a monthly budge to see what you spend every month. Download 3 months of your bank statements and use them to classify all your expenses. Create a Saving Plan – Typical down payments are 20% of the purchase price to avoid mortgage insurance. Most buyers don’t have that cash just sitting around, so developing a plan to save for your down payment is crucial. Your spending should also not be erratic either. Avoid any large purchase such as a car or expensive electronics. Lenders will look for stable funds in your account 60 to 90 days back from when you apply for the loan. Gifts are permitted and some lenders have increased the amount allowed and from whom received. You may also want to research local first time home buyer grants offered by city, county or state agencies. Broward County, Florida has a First Time Home Buyer Program in partnership with the Housing Finance Authority of Broward County and local home mortgage lenders. You’ll also need to take into account closing costs, which can range between 2 to 3% of the purchase price of the home. Closing costs include your home inspection, appraisal, lender fees, title search, and other property transfer related expenses. Create a Need/Want List – I tell my buyers to prioritize features into “needs” and “wants”. The “Need” column contains all the things the house or property must have. These are items you are unwilling to waiver on, like having a 5 minute commute, or has to have a driveway to accommodate your mini car collection. The “Wants” list are items that would be nice to have in the home, or something maybe you can update or add-on later. This will help you keep your mind clear when looking at properties a few months down the road. Research Neighborhoods & Property – Drive around the neighborhoods that interest you. Stop in a few open houses while on your journey. You’ll be able to gauge pricing of each area, and the difference between updated and a fixer-upper. Check out active listings on national web sites like Realtor.com. Research Lenders and Real Estate Agents – Start by asking people you know who they used. Referral business is the best way to get a recommendation, but it’s not always a guarantee you’ll experience the same level of service. So interview several professionals and select the ones that offer you the best options. Mortgage brokers will shop for the best rate among multiple lenders, while a banker can only offer you that bank’s products. When interviewing real estate agents. look for those which specialize in working with buyers, such as an Accredited Buyer’s Representative who will work in your best interest to find you the right property, negotiate with the seller’s agent, and shepherd you through the closing process. Discuss Breaking Your Lease with Your Landlord – If you are going to purchase the home prior to the end of your current lease agreement, you may want to speak with your landlord about your intentions. If you have a good relationship and have been a good tenant, most are willing to forgive the remaining term without penalty. Keep them informed during the process and the open communication will be appreciated. Get Loan Pre-Approval – Make an appointment with your mortgage broker/banker and bring all the paperwork you’ve collated. They’ll begin the approval process and give you a pre-approval. The pre-approval tells prospective sellers and their agents that you have submitted your financial information to a lender, the lender has pulled their credit and addressed any potential issues, and has ran the loan through automated underwriting. Start Home Shopping – Meet with your agent to start previewing homes. Bring a notepad or tablet with you to take notes on each listing. It’s recommended not to see more than 4 homes in any one outing to avoid mixing up features in your memory of what each property has to offer. Avoid homes that are priced well below market value and have been on the market a long time…they tend to have repair issues with costs higher than a typical first-time home buyer wants. Make Your Offer – Your real estate agent will prepare an offer to the seller with all the terms you desire. Inspection period, closing date, loan terms and any other contingencies will be spelled out on the contract and addenda. The seller may accept the initial offer, or back and forth negation will occur until an agreement is reached. In South Florida, closing typically takes 4-6 weeks for a home purchase with a mortgage. Cash purchases can be completed in as few as 14 days. Research Inspectors – The first item you’ll have to do is have the home inspected as part of the contract. In South Florida, a home inspection should cover the structure, interior mechanics of the home, appliances, electric and plumbing, HVAC testing, roof inspection and wood destroying organisms. You may also want to have a mold test done if there is evidence of water damage, or if the seller has disclosed water problems in the past. Waterfront homes with a seawall will require a seawall inspector. Finally, you may also wish to hire a plumbing specialist to inspect with a mobile video cam the sewer line that runs from the house to the city connection. Many of these cast iron pipes are at the end of their lifecycle and repairs can be costly. Basic homeowner’s insurance does not cover this, so a $500 inspection is better spent than a $50,000 emergency repair. Give Notice to Your Landlord – Most leases require 60 day notice if you are not going to renew. Find Home Insurance – If obtaining a mortgage, your lender will require homeowner’s insurance. Even if you pay cash, homeowner’s insurance is recommended. Again get referrals from friends or family, your real estate agent or the mortgage broker. Make sure to discuss any exclusions and how you can save money by altering deductibles. During the contract process – Your real estate agent and lender will guide you through the steps to closing. Typically, you’ll provide lender with any remaining paperwork, conduct your home inspection and negotiate any repairs or credits, pay for a home appraisal through your lender, provide secondary deposits if required, obtain your homeowner insurance, and have the closing agent conduct a title & lien search and prepare the necessary paperwork. Schedule Your Move – The most dreadful part of the experience! Packing everything you own and uplifting your life for 30 days until you move in to your new home. Pack out-of-season clothing and holiday items first. In the kitchen, pack everything not used for everyday cooking. If it’s August, you’re not going to need that turkey roaster. You may opt to use a Pod service and pack the container over the course of a few days or weeks then have it picked up and delivered to your new home. Whatever moving option you choose, planning is key to a smooth transition. Home Walkthrough – This is vital for every buyer. Your real estate agent should be there as well as the listing agent and the sellers could be as well. Note anything that is different from the day you went under contract. Insure the same appliances are there and functioning as during inspection. If the house was occupied especially look for any possible damage caused by the sellers moving out. Anything of major consequence should be brought to the sellers attention and remediated. Wire Transfer Funds – During closing you will sign lots of paperwork. Often in duplicate or triplicate. In addition, your lender will be wire transferring the mortgage funding to the closing agent’s account, and you will have been given instructions 24-48 hours prior to wire transfer any funds due by you prior to closing. End Current Lease – Conduct a walkthrough with your landlord and prepare a move-out checklist and have him sign it. Return all keys and other access items to the landlord. Your deposit could be returned immediately, or by law within 30 days unless he provides written notice during that period claiming a portion for damages/repairs. Utility Services – Contact all utility providers and move or start service at your new home. Water, trash and sewer service utilities require the closing statement as proof of ownership, so bring that with you. A deposit may be required if you have not established service with that utility. Congratulations! You are now a homeowner. It will be a tiresome few weeks getting moved in your new home, but once settled you’ll be happy with your decision to invest in yourself and enjoy a piece of the American Dream.